Experience the unique atmosphere of an authentic 5 star campsite in the Landes by staying at the Sylvamar! This prestigious establishment has all the elements to instill you with happiness and promise you comfort! If you are looking for luxury and space, the Sylvamar campsite village is the perfect setting for you! Find it in Labenne, in the Aquitaine, in a coastal region (sea 900 m away and beach accessible on foot) and close to Cap-Breton (8 km away) and Hossegor (13 km away). At the Sylvamar campsite, you are right at the heart of a 21 hectare pine wood! This campsite has it all: prestigious water park (2 pools, wild-water river, slides, etc. ), various clubs (Yelloh ! Kids, Yelloh ! Junior and Yelloh ! Teens), many services (high quality restaurant, tourist information, etc. ), playing fields, high quality accommodation (managed by an English-speaking operator), etc. Enjoy its festive atmosphere in summer and have some crazy fun with Sylvamar's well-trained team! In the evening, you will be delighted by the concerts, games, discos, etc., while during the daytime you will be able to choose between trips in the region and the pool-side activities offered (water aerobics). 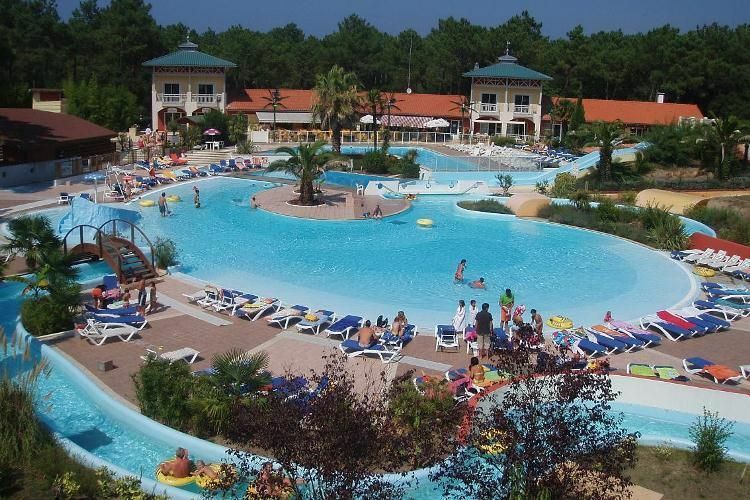 In the Sylvamar campsite, don't forget to make the most of the benefits of its "Dune et Eau" spa centre. Finally, don't hesitate to try out surfing, rafting, sea fishing, canoeing and boat cruises, discover areas, forget all your worries and have fun! Biarritz train station (25 km). Discover a land of traditions with its bullfights, its course Landaise, its folklore and its gastronomy at the height of the joie de vivre that reigns in this region: bars, restaurants, cider breweries, great spots and local produce. You will fall in love with the nature and be stunned by the vastness of the beaches.